Growing Destiny International Ministries from nine members in a hotel conference room to an East End Institution is only the beginning for Pastor Michael H. Smith. Pastor Mike, as his members fondly call him, has been involved in full-time ministry since August of 1994 and founded Destiny in 2001. After the launch of Destiny, Pastor Mike held services in various venues; ranging from a warehouse, a rented church, to the Homewood YWCA, before finally purchasing the former Lemington Elementary School from the Board of Education in 2008. Pastor Mike holds a Master’s Degree in Religion from Trinity School of Ministry and has completed all course work towards his doctorate in education and leadership from Oral Roberts University. 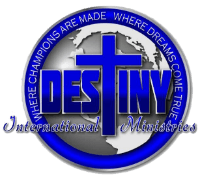 Destiny International Ministries is a Church that will help you identify your potential and will teach you the Word of God. We would be honored to have you as a member. lf you are interested, see one of our leaders who will be happy to start the process of you becoming a member. Camille Clarke-Smith is the wife of Pastor Michael Smith married April 8th, 2017. Their hearts connected on the love they have for their African American people. Camille is a Deacon as well as the Co-Facilitator of Reading to Inspire Sisters to Elevate (R.I.S.E) Book Club and the Wellness Director of the church. Camille instruct the Box-Aerobic classes held at the church as well a the Instructor of the Diabetes Prevention Program and Health Fair Coordinator. Mrs. Smith is also a pro fitness competitor owner of Camille's Fitness and is currently pursuing her doctorate at the University of Pittsburgh. Elder Devin is head of leadership at Destiny, he is also second in command to Pastor Michael Smith. Devin is a Licensed Counselor and serves as the counselor of the church. Minister Scean Joined Destiny December 04, 2016 and was made Minister of Destiny on May 28, 2017. Minister Scean serves as a member of the Lean Mean Green Team our lawn maintenance team and Leader over the New Members and New Family Ministries. Minister Scean also teach a six week course in discipleship called "The Road to Discipleship". + Commissioned and anointed by God to equip the believer with the tools to fulfill their Destiny in God. + Called by God to establish an elementary school in addition to a school of ministry. + Called by God to "Reverse the Curse" upon our young people by establishing programs that are designed to direct them towards their God ordained purpose or destiny. + Called by God to help establish other churches around the world.